Over our many years of raising cattle, some individuals stand out and are remembered — but not always for their best qualities. Sometimes they are remembered because of unusual circumstances or a challenge involved in rescuing them from a life-threatening situation. One little character that earned a place in our hearts as well as our memories was a raggedy little calf named Orphy. 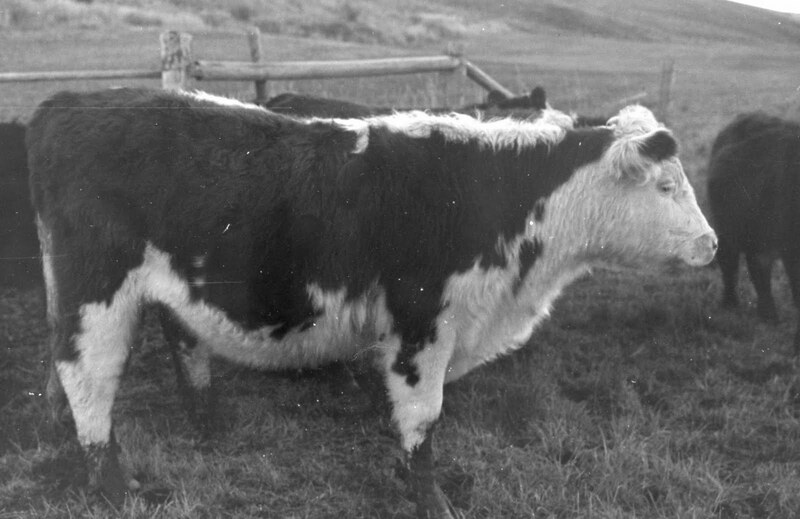 His original name was Glortimer (yes, all our calves are named; it was a fun challenge to think up 150 to 170 new names each year). His mother was a young cow named Glory Belle, a daughter of old Gloria, one of the heifers we bought soon after Lynn and I were married. 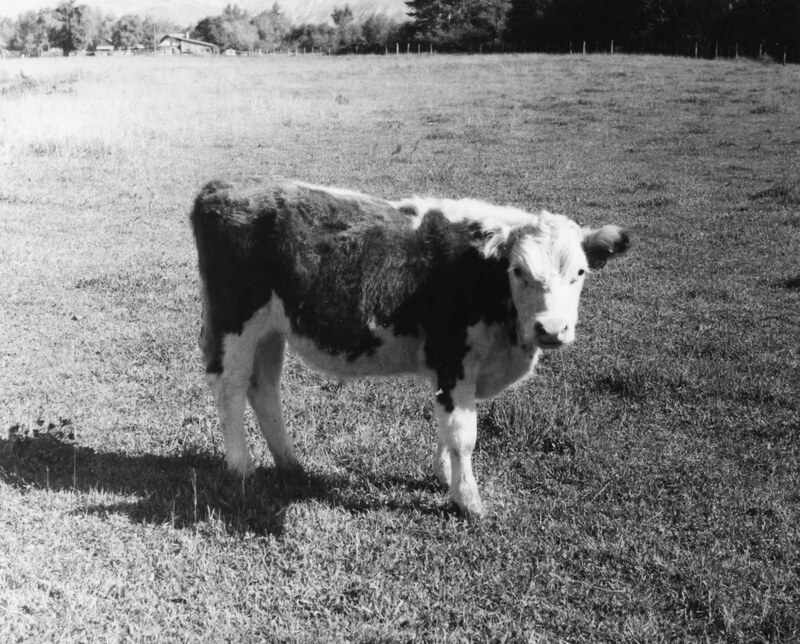 Glortimer was a fat little calf when he and his mama went to summer pasture in the mountains, but then the cow disappeared. Glortimer was only two and a half months old — much too young to do well without a mama. We later discovered that Glory Belle had been shot and butchered; we found part of her hide that the rustler left behind when he skinned her and took the meat. Orphy was stunted and weak when we brought him home. At seven months of age he was still the same size he'd been at two and a half months when he disappeared. The last time we saw Glortimer (while riding our low range pasture to check on the cattle) was probably a day or two after his mama was butchered. The calf was bawling, and we spent several hours looking for Glory Belle but couldn’t find her. 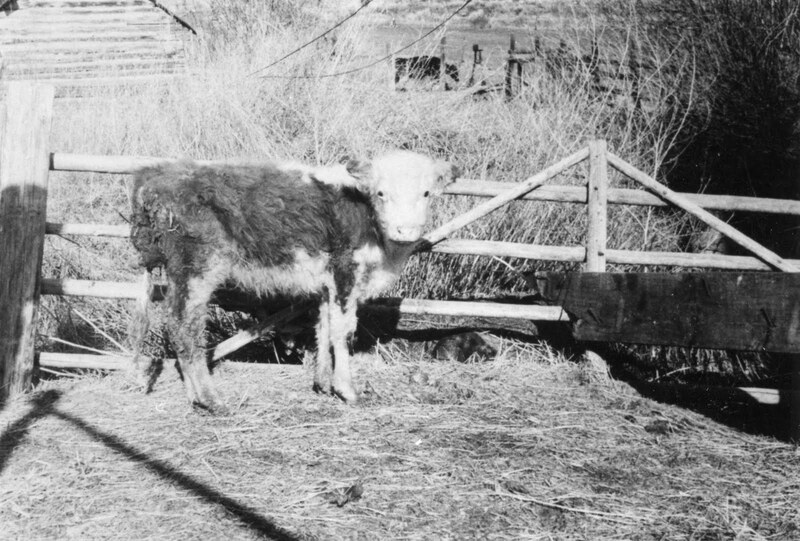 The next day we rode again, to gather the cattle to move to the next range pasture, but we could not find Glory Belle or her calf. We were suspicious that something had happened to her; maybe she was dead in a gully somewhere or struck by lightning. We searched for her and for her calf until dark, with no luck. We’d hoped to find the calf — to bring him home and raise him on one of our milk cows — but he was nowhere to be found. It got too dark to keep looking, so we gave up and came home. The next day we started early and rode all day, searching the whole pasture again, but he wasn't there. We thought he might have crawled through a fence to get in with our neighbor's cattle, so we rode through their pastures, too, but couldn’t find the little calf. On one of our rides searching for him, we came across his mother's hide, which had been thrown into the brush after she was butchered. Finally, we gave up our search for the calf. We felt bad about not being able to find him; we were afraid he would die without a mother, since he was so young. Our neighbor later told us he'd seen a stray calf one day with his herd, but the calf didn't stay. Apparently, the little orphan had gone through their pasture but kept going through more fences, searching in vain for his mama. We figured he probably died somewhere, starving to death. Late that fall, however, we got a phone call from another rancher farther down the valley. A skinny little calf with our brand turned up with his cows when they came home from their summer range. We could hardly believe he'd survived the summer on his own. This had to be our orphan, because we were not missing any other calves. Lynn and I drove down to Clark's ranch and looked at the pathetic little creature in the corral. It was our calf; it had our brand, and the ear tag was Glory Belle's number (each of our calves has an ear tag with his or her mother's brisket tag number). The poor little guy was a tiny bag of bones with long, shaggy hair. He was even smaller than when we'd last seen him, in June. He’d survived but had not grown; he'd lost weight and was not healthy. He was very weak, with diarrhea, lice, and worms. He needed a lot of tender, loving care and was still at risk of dying. We loaded him in our pickup and brought him home. We started calling him "the orphan," and he was soon known as Orphy. He was too weak to be wild or afraid and didn't struggle as we lifted him out of the pickup and carried him into the barn. The fall weather had turned cold and rainy, and we didn't want him to get chilled and develop pneumonia in addition to all his other problems. We put delousing powder all over him to get rid of the lice and tried to feed him hay and grain. He didn't know how to eat grain and was only half interested in hay. He refused to nurse a bottle and was so run down and weak that he didn't seem to care. As the days passed, he ate a little and seemed a bit stronger. We dewormed him, but he still didn't do well. Being weaned so young, and not having the milk he needed, he hadn’t had adequate protein or nutrition for growth, and his bones were tiny and frail. At two and a half months of age (when his mama died), his digestive tract was not yet ready for handling a total diet of roughage, and it's a wonder he survived. By now he was so stunted and sick we weren't sure if he'd be able to recover. We gave him the best hay we had, but there came a day that winter when he just gave up. We went out to the barn and found him lying in a corner, almost on his back, too weak to get up. We propped him up and hung a heat lamp over him because the weather was very cold. We fed him some milk via stomach tube (down his nostril and into the esophagus and stomach), since he was too weak to eat or drink. After that we fed him milk every day with the stomach tube, to give him the nutrition he needed and to help him get stronger. He was almost a year old by that time (past the age that calves drink milk) but only as big as a three-month-old calf and too weak to eat anything. Once we started giving him milk, he seemed to feel better and began eating a little hay again. But he was still too weak to get up by himself; we had to assist him to his feet. We continued to feed him milk via stomach tube, since he still refused to nurse a bottle. I guess it had been so long since he'd had a mama, he'd forgotten how to nurse. We also gave him injections of vitamins A, D, E, and B complex. After a couple of weeks of feeding him milk, Orphy was strong enough to get up without help, and we had hopes he might recover. Gradually, he gained strength and started eating more hay and a little grain. We kept feeding him milk by stomach tube (milk from our family milk cow) all spring and into the summer. When green grass came, we turned him out in a little pasture near the barn. I fed him milk once a day, but he didn't like the stomach tube and would usually retreat to the corner of his pasture, trying to get away from me. But since he did like the feeling of milk in his tummy, he would stand there and let me put the tube into his nose, to the back of his throat where he had to swallow it, as I pushed it on down into his stomach. Then I'd pour the milk in with a big funnel attached to the tube. With green grass to eat, and the milk, he started to look like a calf again instead of a bag of bones. Orphy "lost" a year of his life, being starved and stunted. He didn't grow much at all during his first year. But the summer he was a yearling, as we continued to feed him, he began to grow. We finally stopped giving him milk when he'd caught up to what a six-month-old calf would look like, even though he was actually a year and six months old. By that fall he looked like a big calf, and by the next year, when he was a two-year-old, he looked like a good big yearling. Lots of tender, loving care had helped him make up for the starvation and hard time he'd had while wandering forlornly around in the mountains without a mother. Heather Smith Thomas raises horses and cattle on her family ranch in Salmon, Idaho. She writes for numerous horse magazines and is the author of several books on horses and cattle farming, including Storey’s Guide to Raising Horses, Storey's Guide to Training Horses, Stable Smarts, The Horse Conformation Handbook, Your Calf, Getting Started with Beef and Dairy Cattle, Storey's Guide to Raising Beef Cattle, Essential Guide to Calving, and The Cattle Health Handbook. You can read all of her Notes from Sky Range Ranch posts here.